Jive Hosted VoIP Review: "Jive was a Great Move for INSURICA and Our 30 Offices"
We use Jive Hosted VoIP at all of our 30+ insurance agency locations across five states. We've grown through acquisitions which means we inherited a wide-range of legacy on-premise phone systems. Jive gave us a powerful alternative system that we could standardize on. Plus, we can manage every location via one browser-based management console which improves efficiency. The cloud PBX is simple, yet very powerful. This enables us to customize the configuration (dial plans, call flow, etc.) for each of our offices based on their size, preferences, and culture. Furthermore, being on Jive is exceptional when you need to move an office to a new location or in disaster scenarios. It is so easy to reroute calls on the fly to another office in a matter of minutes. Eliminates the need for complicated, expensive on-site equipment and phone line trunks. This reduces cost and overhead. Very easy to use and configure. I've yet to encounter a situation where I couldn't meet the request of one of our users with Jive. When we first started with Jive, I was a novice with phone systems. But, I found the Jive PBX easy and intuitive to configure. This eliminates the need for a dedicated phone administrator. Since all our phone numbers are held in the Jive cloud, it is very easy to make any number ring at any of our 30 locations. This is incredible for disaster recovery and business continuity needs. We wish Jive had a stronger unified communication client. They've made strides in this area over the last few years, but it still isn't as powerful as other things we've seen. We had the chore of migrating 30 offices to Jive from a wide variety of carriers and legacy systems over the past few years. This was challenging and while Jive did a pretty good job, I feel like they could have been better in terms of helping us manage this process. Jive is very well suited in most situations. For us, with multiple branch office locations, it is perfect. We don't have to support expensive, complicated equipment on-site all over the place. The architecture with Jive is very simple and straightforward. However, even if we only had one office, Jive would still be my choice. The only situation I can think of where Jive might not be appropriate would be if you had really poor Internet service. Obviously, voice quality is dependent on a decent Internet connection with Jive. 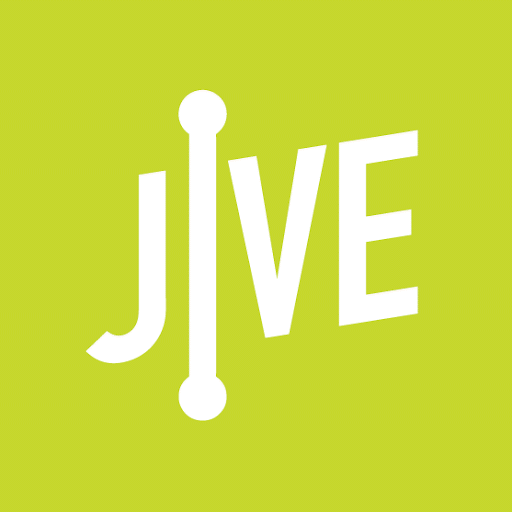 However, we've been very pleased to learn that Jive operates very well in all our locations and they have tools to help you determine if your connection is good enough to support their service. Jive Hosted VoIP Review: "Jives with and Exceeds our Needs - For the Right Price!" We use Jive across our organization, using on-site phones, Jive Mobile, and Jive Web, which allows us to be available for our clients virtually 24-7. We have also implemented Jive's included Virtual Fax service allowing us to consolidate our vendor list and continue to work without cumbersome equipment in the office. Jive's All-Inclusive service was a huge draw for us; we are a small firm and need to be able to provide the maximum number of services and technological advantages without being nickel-and-dimed. Jive's Tech Support Team has been fantastic. We are tech-savvy but occasionally run into issues where calling to verify procedure is a necessary option. The tech team is available 24-7 (something some of the larger competitors cannot boast) and everyone has been extremely patient, and helpful at every point, and have even taken the time on occasion to personally go out of the way to get answers from another department when needed. Jive Mobile and Jive Web Allow us to work from home and on-the-go. In fact, I took a client call at 7:30 AM this morning that would have otherwise been missed. The only issue we've had with Jive is using the Mobile/Web applications where calls do not always come through, despite connection being strong, or audio issues where neither party can hear anything. (However it is noted that Jive has been making updates to the Mobile App regularly to fix these bugs). During our waiting period when our numbers were being transferred from our current provider we had to add extra phone lines to ensure we were all available for call transfers; however the support was wonderful and we cannot argue with the cost as it was so ridiculously reasonable to solve this problem. Small businesses, law firms, companies with department devoted phone lines, and even calling queues. Directory Dial, Ring Groups, and Dial Plans make this great for companies of almost any size. Be sure to verify that existing VoIP phones are supported by Jive; we recently upgraded our phones and one that we were looking at was not supported so we ended up getting a different (better) phone. Jive Hosted VoIP Review: "Jive is awesome!" Jive is being used across my entire organization. 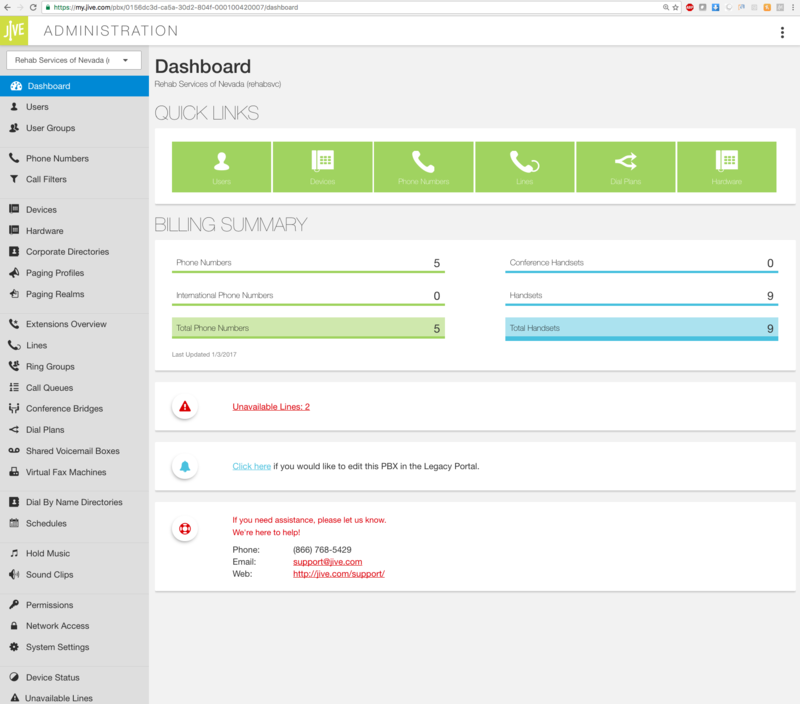 We implemented Jive to completely replace a traditional PBX. Call recording: you have to setup an Amazon S3 bucket and Amazon was terrible to work with to get this setup. There is no interface to retrieve recorded calls, so you have to dig through several layers of recordings to get to the call you want. They were just sold, so not sure if anything will change because of the purchase by LogMeIn. Great flexibility for a small to medium size organization to have the features and functionally you would only get in a large PBX system. Their month to month pricing was very competitive, so I did not have to get into a long term agreement to get very competitive pricing. Review: "Jive Hosted VoIP makes voice Implementation plug & play for your environment!" We use Jive Hosted VoIP in our home office location which currently has about 20 users. I also recommended and installed it at another school with about 35 users. Easy to Implement, plug & play. Easy to manage in the Portal. Portal Management could be more user-friendly. Auto Attendant Menu could be more user-friendly. Jive Hosted VoIP is suited for organizations that already have a good network infrastructure and want to implement an easy to use voice system. It really is plug & play after Jive has configured all the devices. Jive Hosted VoIP Review: "Jive is Great"
I wanted to be able to track calls in my CRM and found that Jive had a Connector to Zoho. It logs all of our calls to our clients inside their account. It does not copy a recording of the call, but it does give duration, time start/end, and notes can be left on each call on a screen popup inside the CRM. Integration with our CRM, it was important to be able to track calls to ensure our sales staff is meeting it's goals. Easy to set up and use, we have over 20 numbers that we use to call out from and was easily set up to be able to call out from any of the numbers from any phone. The admin side of Jive is very user friendly and can be set up easily with little assistance. Text messaging would be an awesome feature that the system is lacking. 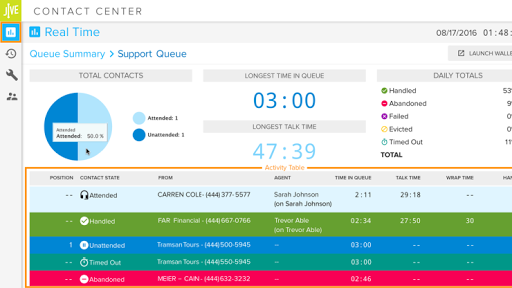 If you are looking to log calls to your CRM, check out Jive Hosted VoIP. If SMS is important, keep looking. Calls can be recorded locally or all calls automatically recorded. It is a little bit of a hassle to retrieve them. Easy to set up and operate inside of, and end user friendly. Jive Hosted VoIP Review: "Jive is the way to go - hands down. An easy decision to save lots of money." Our company was looking for ways to cut costs across the board on things that we haven't evaluated in a long time. One thing I was charged with doing was diving into our telecom service. We were paying way too much. I explored a few options and landed on Jive. Jive was a substantial cost saving and gave us everything we had in our VOIP phone service, plus more features. Jive was able to free us from the cumbersome phone system that runs off of hardline internet connections and is planted on every single desk in our office. Without having to give our cell phone numbers out to people, we were able to continue using out existing phone numbers and set-up individual dial plans that work for each person's needs and schedules. The ease of use is probably the number one case I can make for Jive. It is so simple to navigate their online platform and to create dial plans within a few minutes. Their drag and drop dial plan builder is fantastic. And I can change it on the fly and in a matter of minutes - without having to call a support center. Jive's support is also fantastic. They essentially send a welcome email, walk you through about five steps to port numbers into their system, and then say, "okay - we're ready to walk you through the set-up whenever you are ready - any time, any day." When I called, the agent was incredibly helpful and walked me through the things I needed to do to get set-up and then also walked me through all the features. He set-up the things we could set-up on the phone and showed me how to configure other features when the time was right. The sales process was very easy. We called, talked to an agent, and got a proposal within about 15 minutes. We evaluated the proposal and notified them the following day that we were ready. Because porting numbers takes a few days, we took the few days to ensure everything was set-up and ready to go. The numbers went live a few days later and we haven't looked back since; so seamless! The app is a great plus. It is very easy to use. Not only were we able to actualize substantial savings right off the bat, Jive also came with a subscription to GoToMeeting for every user, which saved us additional dollars we've been paying for web conferencing services. I wish there was either a dedicated admin app or admin functions for admin users on the standard user app. I do have to go to my computer for some things (which isn't that often, however). We ported our fax number over. Doing that means the faxes come through via email to a single email address, which means I have to either have someone sort the faxes (and there's not a lot of them) or give everyone access to the fax email account. I wish there was a way that all faxes just show up in a shared folder for people to be able to get to easily on the app or on their desktops. I believe Jive is the perfect fit for a company of any size with workers who are in the office or in the field with or without a particular schedule. I also believe that if you are reading this, you should go - right now - and look at how much money your company is wasting on traditional/analog and/or VOIP services. I think this is GREAT solution for start-ups and large companies alike who need a SIMPLE solution that works great and is affordable. Also, the service grows with you. You pay per user, and it is incredibly affordable. As your company grows, just add more users! Jive Hosted VoIP Review: "Jive Beginnings"
Our company uses Jive to direct incoming calls to the main phone number to the various departments and field offices. We needed to replace our server based system with a cloud-based system. They have a great interface for creating simple to complex dial plans. I didn't think we needed something very complicated, but it was easy to see how some of the features that weren't available to us before could be useful. You don't need to download a desktop application. The mobile app is very streamlined, which keeps it from becoming a technical issue. The support people are great, but it takes a very long time to get a hold of someone. As the administrator I have had a difficult time re-finding some of the set-up pages because it's a little bit of a maze to get between the Voice side and the LogMeIn account. Jive is really well suited for small businesses with mobile and flexible employees. Our company has employees in 4 different states that work from home, the field and the office. Jive keeps everyone in contact and helps us know what everyone's status is. We have a couple locations that couldn't switch over to an IP based phone system, and it was easy to get calls routed to the analog phone lines. Jive Hosted VoIP Review: "Jive: Worth a chance." Jive solves the seamless integration of mobile offices. Being able to stay connected from remote locations, even while on the road. They also give us the ability to send out SMS messages to our clients that prefer that over an actual voice call. The only thing I would like to see is an actual softphone we can use with the platform. Cost, hands down it beats the competition. Jive Hosted VoIP Review: "Jive is good for early startup support centers, but only as a stepping stone to more robust tools as your org grows"
I no longer use Jive but while we did we used it across sales, implementation and support teams. It was our primary VoIP for our whole organization. They make it very easy to set up and create call flows and IVR's. I could manage them from an intuitive dashboard and could make changes quickly as needed. Jive was very affordable as well. For the price point, the reporting and admin tools were solid. We ran into issues with uptime while using Jive. We would have outages too frequently and they affected our service level agreements. All of the support we worked with was outsourced and often they struggled to understand my needs or what we were trying to accomplish. It doesn't provide an omni-channel tool (chat and email) which is ultimately why we stopped using them on the support side. We still use them for other departments that don't require intelligent routing. Well suited for startups and companies that don't need an Omni-channel tool to manage chat, phone, and email. If you need to build out a full support center with WFM tools, Omni-routing, etc, then Jive is going to be too basic to meet those needs from my experience with them. Jive Hosted VoIP Review: "Jive Speaks The Language of Business; and That is No Jive!" Jive is being used across our organization by multiple departments. It is our main phone service provider and has changed the way we use our phone system. While we have used multiple phone providers, Jive is the only provider that has actually lent itself to our company in a way that helps us grow our bottom line. Jive allowed us to easily control our PBX system and helps our business, though relatively small in size, look and feel like any large organization. It gives us the measure of control we need to serve our clients in a meaningful and powerful way. Jive has an easy to use interface that lends itself easily to changing the system whenever change is needed. The PBX portion is particularly useful in the way it is easily malleable and has an incredibly powerful and easy to utilize setup. Jive's app is very useful and easy to use with mobile devices. Very powerful and adds a lot of value to their service. The way Jive functions has suited our organization very well. It is easy to use on a hard phone, has a great soft phone feature that functions out of a browser and easily integrates with our chose CRM for click to dial features that have also proven quite useful. Jive has less than stellar reporting. When previously choosing phone providers, Jive had come in a close second to another, larger competitor simply because of its reporting. When that competitor proved to be less than reliable we did eventually switch to Jive, but it is the one, large Achilles heel of Jive. The PBX interface can have a steep learning curve for some people, and it sometimes is not easy to see the logic behind some of the organization in the way it is put together. Jive's app can sometimes be disconnected from service for what seems like random reasons. It is not a frequent problem but can be annoying. To be fair to Jive this may be a network issue and not an app issue and it bears further troubleshooting. I would recommend Jive for any SMB organization as it makes them look larger than they are and allows for powerful tools at a reasonable price. Small business especially can benefit from its ability to route calls in multiple ways allowing them to add diversity in their call tree and allow less users to act like more users. Large business can also benefit from Jive simply by virtue of the system being easy to use. In a large org, the call tree can be complicated. Jive's easy to use drag and drop interface allows for ease of implementation by large org's making setup of the PBX a snap. Jive Hosted VoIP Review: "VOIP?! Yes, you should and Jive should be your first stop." Jive hosted VoIP is our main phone system that connects 8 locations in 3 states together with seamless use of extensions and transferring. Throw in simple management of VM and call attending with their new call center option means they are all encompassing tool. We solved the need of an advanced PBX without the cost and setup of a local system. With Ethernet being already a main runner for our structure adding POE to get phone service was a no brainer in construction. The benefits are a connected PBX, voicemails and calling features not restricted to office spaces and one location, Connecting locations that before had no reason to be connected but now with Jive the connection was made and has been a positive one. Adding new devices that are new or previously on the account is simple and easy for even not technical people. This is not always IT staff on staff, with Jive online management makes it very simple for setup. Another strength is the calling tree setup. With a graphical interface, drag and drop options and suggested setups anyone can build a complicated setup to a small simple one. Take your small business and make it look like you are fortune 500 with a nice call tree that is simple to use but sounds big. Customer management. Every representative we have worked with including the technical support staff are superb. Quick fix errors, online chat for support and a dedicated rep for your company that is available and checks on your account on time everytime. With VOIP ghost issues. They are plagued with a few sometimes and when these happen a run down to an issue is almost non existent. This maybe a VOIP providers issue for all of them. But it does exist here and they do try to help but leads usually end up at dead ends or false positive answers. Reports, sadly their reporting system is only for current calls and information. They have no historical reports you can run. You have to contact them for these reports. Jive is well suited for small to medium sized businesses and businesses that are split in different locations. Being connected via VOIP and the internet it will seem you are right next to each other. Jive will not be appropriate if you are in an area with questionable bandwidth or use Vsat. Honestly that's the one reason I could see someone not choosing Jive or VOIP in general. Its easy, fast and reliable. No server or box on site. Great support, just cut the rj11 and join the rj45 team. Jive Hosted VoIP Review: "Jive - Good, but not great." Jive was our VoIP carrier for our Polycom phone system at all of our various sites (both permanent and mobile with the use of Mobile Office Systems we set up). It handled all local and long distance calls without the need for 2 or more carriers/connections into the building. It also allowed us to use a mobile app on an older deactivated iPhone for our receptionist when she needed to step away from the desk but still answer the phone. Support was iffy at best, usually not giving clear answers to problems and just closing tickets after responding. While phones were customizable via their interfaces, the changes were lost after a reboot (such as a logo for the background or a ringtone) with no way to save the settings. There were a lot of service affecting issues we experienced. Jive is a good solution for a business of any size really, as it is very easily scaled to meet your needs. It's reliability, while decent, was not great, however. The user interface was easy to navigate, and the (at the time) new beta interface was very intuitive. It is easy enough that a small business could easily manage their small system, but powerful enough that a large business can set IVRs, call forwards, etc., as needed. The mobile app is a great addition as well and works very well as a basic VoIP app. Jive Hosted VoIP Review: "Jive VoIP an efficient service for small companies"
We use jive as our primary phone service for our entire company. We use Jive for internal calls as well as external calls. We are a client facing company and have to get on a call with clients to support and maintain the software we sell them. We also use it to call our international clients as well. On a day to day [basis] for our organization, we have to contact clients about the tickets that they have created as well as call new clients for implementation. I think Jive is very good for a small organization and if it fits in the budget. It works well with a small team that is client facing. I don't think Jive is appropriate for huge organizations as it is missing a lot of features that are needed for collaboration amongst team members. Jive provides cloud-based phone systems and Unified Communications services to high-growth businesses and public sector institutions. The vendor aims to offer a scalable platform that is more flexible and cost-effective than their existing legacy systems. Jive’s cloud architecture offers an integrated, seamless experience that provides richer context and creates more efficient connections between co-workers and clients. Since its founding in 2006, Jive has grown to become the largest privately held Hosted VoIP provider. The cloud delivery model ensures that each organization always has the latest technology, features, and applications. Sign up for a no-obligation month-to-month account, or sign a long-term contract for better deals on service pricing and hardware. Jive provides all the features you need with unlimited use (where other companies charge extra for additional features or increased use). Customer & Technical support is available 24/7 to help you resolve any issue. A dedicated onboarding team will help you get your phone system set up for your needs.